Buster hates to see a man make an honest living. Anyway, he hates to see a man be on time to the place where he makes his honest living. Buster loves Daddy all the time, in an off-hand kind of way. But at the moment when Daddy absolutely has to leave for work, Buster loves him like someone who really likes him. He knows I’ll be home later, but he clings to me as if I’m headed off on a suicide mission. By now, he should know that I’m not cut out for suicide missions. Avoiding the sharp edges of my paperwork is danger enough for me. On Saturday morning, he won’t need a 10-minute hug. By Sunday, he won’t know what a hug is. But Monday . . . Monday is the first of five consecutive attempts to break Daddy’s heart with a childish brand of parting grief that will make him sorely question his life choice not to stay at home and wait for the government check. The other morning, Buster was sitting on my bed, wrapped in his blanket, watching cartoons. When I sat at the foot of the bed to put on my socks (the dark ones I wear to work), he scooted down to me, blanket and all, and laid his head on my arm. When I tried to get up, he grabbed me and gave me that pitiful, longing look that pleaded, “Daddy, can’t you just stay home and run some sort of Ponzi scheme out of the house?” The poor child doesn’t realize that Daddy’s not trustworthy enough to cheat people out of adequate money to keep up with the rising cost of diapers. 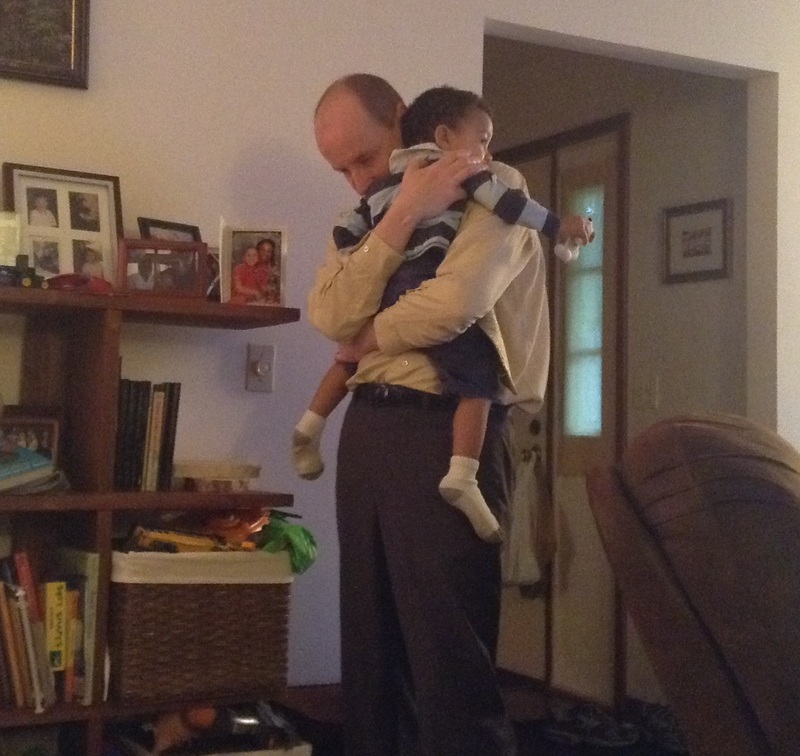 At least he didn’t cry and reach out for me, and have to be held back by Mommy, when I tried to leave the house. That made it one of the easier days to leave him. Buster makes me spend a lot more time not leaving for work than I should. I linger as long as I can, and then I linger a few minutes more. Eventually, my distrust of the adequacy and longevity of government checks spurs me to go. It’s never easy. Fortunately, I have one of those jobs people reference when they say, “It’s not rocket science.” My long goodbyes to Buster have never caused a moon walk to be delayed. All they’ve ever done is push back my first paper cut until 8:07 a.m.
Only Buster clings to me in the mornings. It’s awkward. And annoying. And I love it. This entry was posted in Toddler Trouble and tagged balance, children, Dads, employment, family, fatherhood, home life, humor, parenting, toddlers. Luckily, my husband leaves before they get up. It’s only when he comes home that he is the center of their universe, and Mommy, good old Mommy, the one who cooks for them, cleans for them, and puts up with their s*$t 24/7 is chopped liver. So be happy he loves you and misses you. If you were home all day, he wouldn’t give a crap. Haha. It’s so true. As a stay at home home, I feel the same way most days. My kids cry until daddy pulls out of the drive way and then they are over it. Leaving him with just enough fully to know he’ll come back. When I leave, they wave and tell me they are going to have fun being dudes with daddy. Even when we’re busy being dudes, we all still miss Mommy. It’s just that we’re dudes, so we don’t like to show it so much. I bet they have many times when they want that special Mommy tenderness that Daddy can’t match. If yours are like mine, Daddy had to wait a good while to be appreciated at all. None of them had much use for Daddy when they were babies. Mommy had the fresh milk, at always the perfect temperature, and all Daddy had was a lousy bottle. Kids can’t hide what they want at any given moment, which means both Mommy and Daddy are bound to get their feelings hurt. I could do with TWO good reasons to be late. Store those hugs up in the deepest part of your heart. It will help you when Buster drives a car in the ditch. It’ll be my own fault for getting them all hooked on Nyquil. I remember my daughter’s first day of kindergarten. I was very worried we would have a scene when I went to leave her in that room. I went to kiss her goodbye, testing the waters, and she looked right in my eyes and said out of the side of her tiny smart mouth, “mommmmmm, not in front of everyone!” *sigh* I went to my car and cried. That was the beginning of her independence. I’ve only just recently started getting visits “just because” a few times a week while she waits for her bf to get home from work. She loves me again ……..she’s 22. I like this kind of comedy better; I get to sit down. I think she loved you the whole time. Maybe she just rediscovered how much. At least you won’t have to help her with her homework this time around. You really know how to pull at the heart strings. Love that final sentence. So perfect. Yeah, that’s how I got my wife. She couldn’t resist my final sentences. That’s a good power move. That’s unusual, Scott. Most men score their wives with the elegance of their preliminary sentences. My wife had to be more patient than most. BTW, I’m having some trouble interacting with your blog. The comments want me to log in, which would be fine, but then they want me to allow them to have info about the account I used to log in. They probably could get that info anyway, but I’m loathe to make it easy on them. And your like button always says it’s loading, so I can’t even click that. Maybe it’s my browser, I don’t know. But I am still reading. Ha. I was able to click the like button on Firefox. Progress! Thanks for letting me about this. I switched to Disqus commenting on my website a few weeks ago. (I was getting up to 1000 spam comments a day, which is why I chose to do this.) Let me know if you have any trouble logging in to comment. You should be able to log in with your Facebook or Twitter account. I’m sorry for the inconvenience. Even though I don’t think it is sweet for a grown man to use the word sweet in the context of seeing something sweet. Maybe you should seek counseling for that.